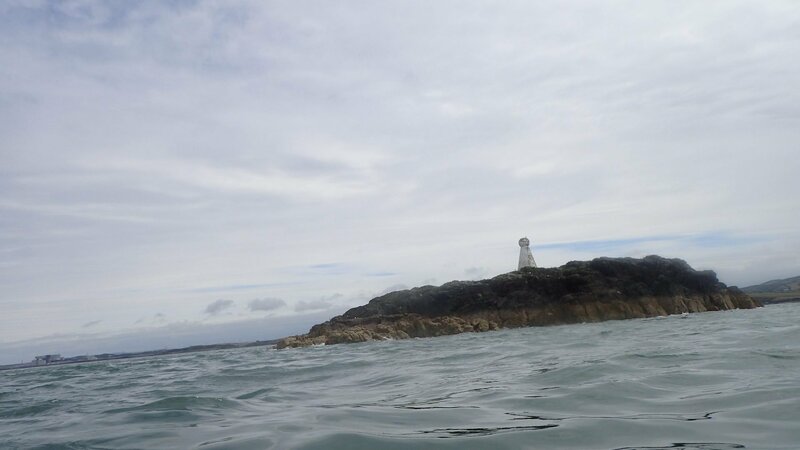 For some time now I've been thinking about paddling around Anglesey. Having read the various blogs out there, by various paddlers who have completed this challenge, I decided I must have a go. 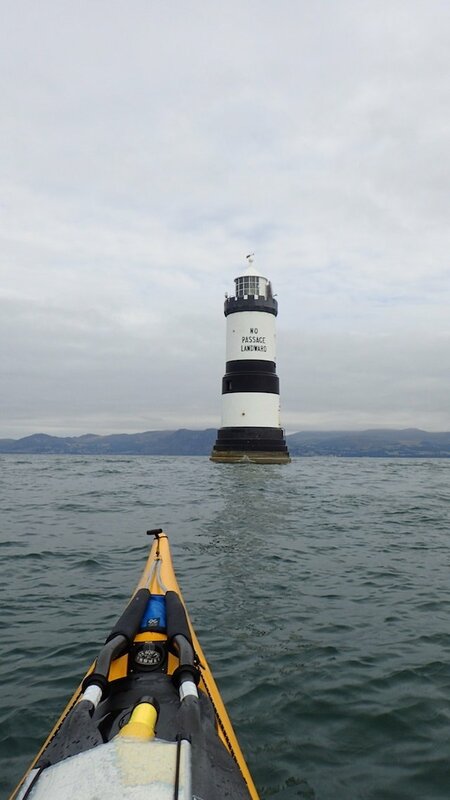 Besides, there are just two small sections of Anglesey I had not paddled, so if anything, it will complete the missing two sections for me. 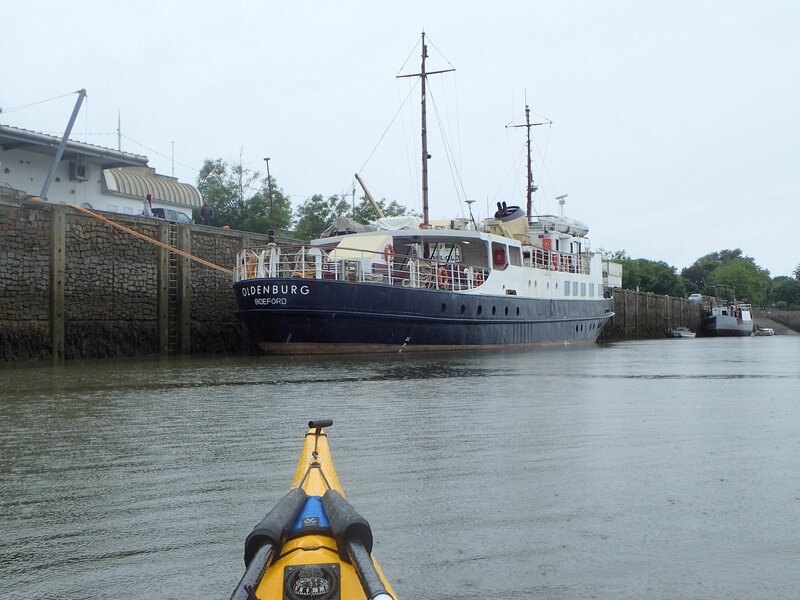 From the blogs I had read it was very evident a big tide is required for a day trip. The other important factors are the choice of start point. 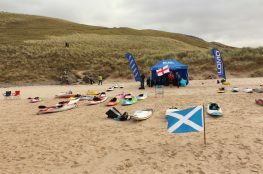 Not to mention the weather, amount of daylight, tide timings, tidal gates and well err... lots and lots of other variables! So, around Christmas time I started creating a spreadsheet, initially based on a start point of Rhosneigr. Going clockwise the first tidal gate is at Puffin Island. You want to be passed there and onto the Menai Straits before the flow starts against you. 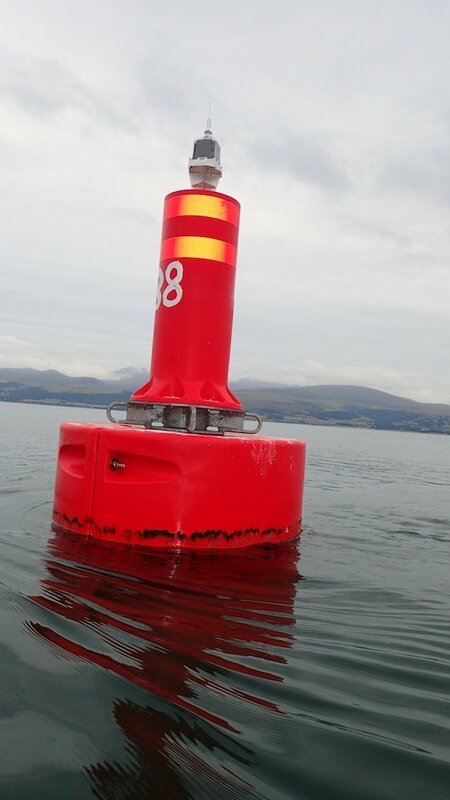 This should then give you a good tidal assisted ride through the straits. 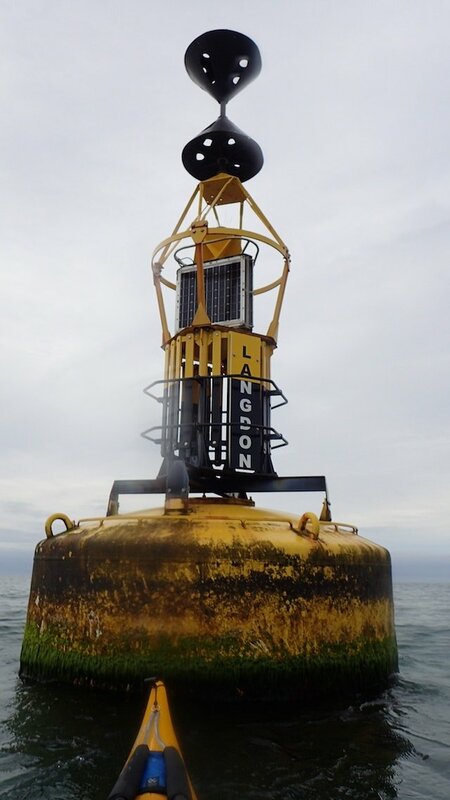 Consequently, the start point is crucial, as you have a limited time to ensure you can reach Puffin Island before the tide turns against you. Being a bit of a technology fan, I used Navionics to plot a course around the island, taking into account my various experiences around the island, ie. where the strongest tidal flow was likely to be. Downloading the course waypoints to my spreadsheet, I had around 60 waypoints, each with their latitude and longitude. Then using a nice complicated formula (see below), I was able to calculate the distance in nautical miles between each waypoint. Having got the distances, "all" is required then is to work out how long it will take to paddle between them. For each waypoint I then calculated the various average speeds of the various tidal flows for a particular date. Direction is generally less important as I made the assumption I would be going with the flow for maximum speed. Then assuming an un-assisted paddle speed of 3.5 kts, I was able to calculate the average speed between each waypoint and consequently the time taken to paddle between each waypoint. Calculation of the various average speeds between each waypoint is crucial. Get this wrong and you will be way out on your timings. 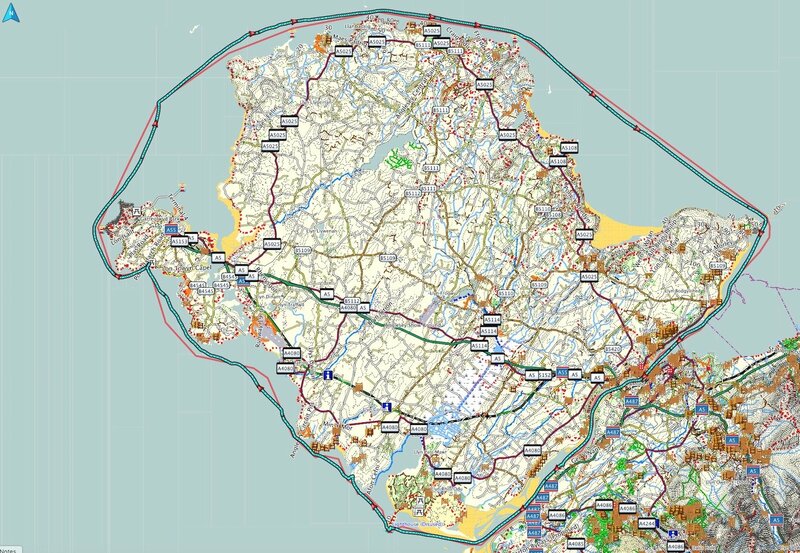 To help me with this I used information from Cruising Anglesey and Adjacent Waters by Ralph Morris, Jimski's Welsh Sea Kayaking, tidal diamonds on charts, speeds from Navionics for the day and just about any other source of information I could find. Having a spreadsheet makes the recalculation easy, as changing an average tide stream value then recalculated the timings for the rest of the spreadsheet. Doing this by hand would be tiresome to say the least. So I started looking at when the big tides occur and picking dates. Everytime, something wouldn't be right, the weather, the swell, the start time, the finish time, taking time off work as not over a weekend, weekends booked out to family events etc. The list went on. June came around and lots of nice hot weather took hold of the UK, but now I am so busy at work I cannot take any time off. This was not exactly helped by a colleague leaving at the beginning of June. Early July, I was, lets say a little stressed out and now work were telling to me to take a break. 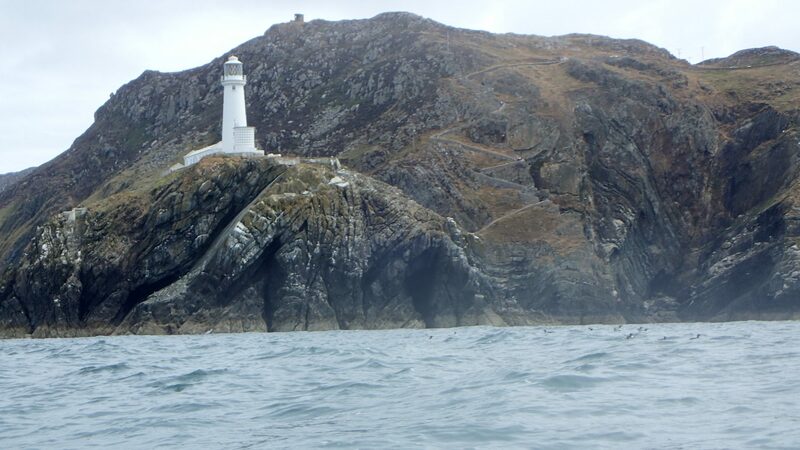 A week from the 15th July was booked and I was planning on paddling to and around the IOM. But in the end this week had further some risks/complications at work. So I then settled on taking two long weekends, the first long weekend (21st-24th July) being a kayaking weekend and the second (28th July - 1st August), Mrs T time. 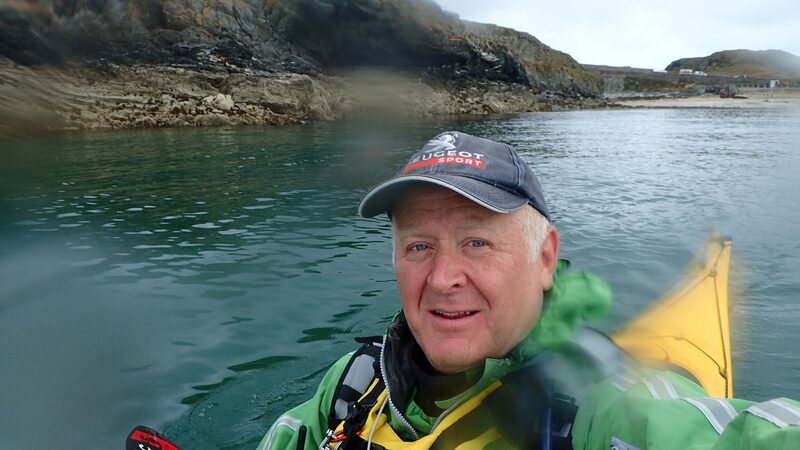 And so, it occurred to me, as I was not going to get to do the IOM, I may as well paddle around Anglesey starting on the 21st July. Checking the tide times, I realised it was a neaps weekend and the start time would need to be around midday, but I thought, why not do it anyway and if needs be, stop off and camp on route. The weather was certainly going to be ok.
Getting busy with my spreadsheet I soon realised that starting at Rhosneigr would be pushing it on neaps to make it onto the Menai straits in time. Besides, where would I leave my van. Next option was Borthwen, but I didn't like the thought of leaving my van down there in the car park overnight and the tidal gate may still be a problem; Equally so for Trearddur Bay. The easiest option would be to go from Porth Dafarch. So a quick change to my route in Navionics, a download of the waypoint co-ordinates to a spreadsheet and a quick copy of the formulae, and I was back to plugging in the average tidal stream speeds. Looking at the results, I could see that with an 11:30 start, I should be able to make the tidal gate at Puffin Island and what would be really nice, would be getting through the Straits to Abermenai point, but it would be late and I would have to be on the water for 12 hours. Can I get that far? Maybe, if I can get that far, I can keep going all the way around with a finish time of around 15 hours! Being a bit more realistic I decided I had better pack food, water, tent etc for at least one stop, and if things really don't go as planned, two stops. Saturday 21st July saw me hanging around Porth Dafarch with a heavily loaded boat waiting for 11:30. I had already telephoned the coastguard and let them know of my plans. It was pointless setting off earlier, as South Stack would not start running until around midday. Jimski asked me where I was heading. I told him I was going all the way around Anglesey and was hoping to get at least Puffin Island and preferably Abermenai. He told me "that is a big ask". Hmmm maybe he is right. He offered me some advice on overnight camp stops around Anglesey which I gratefully received. But when he started talking about stopping at the Brick Works at Porth Wen I was thinking, "I hope I get further than that". Still it was all good useful info and a big thanks Jim. However, I was now a little worried I had made a big miscalculation, but at the same time thought, it doesn't really matter as I have enough days in which to get back if I am wrong. Waiting for the time to set off was becoming increasingly difficult. So I climbed into my boat at 11:22 took, some photos and set off. The first thing I did was to plan a route on Navionics. This involved creating a route and saving it on my iPad. From the iPad I was able to share the route as a file (emailed to myself on my Mac). This gave me each waypoint and its co-ordinates. Loading these co-ordinates into my spreadsheet was just a quick copy and paste. The tricky bit is calculating the tidal assistance. I used as many sources as I could find for this information. You will note that I have also got the tide times for both Dover and Liverpool. This is because Cruising Anglesey and Adjoining Waters by Ralph Morris uses tide timings for Dover, whereas Jimskis Welsh Sea Kayaking uses Liverpool tide times. Some times you have to make a best guess. For instance, what is the tidal assistance between Porth Dafarch and Mini Mawr? For this I used a bit of personal experience as you won't necessarily find this detail anywhere. Of course as you change the tidal assist values the calculated values below your change also get updated. This can be make the planning of the Menai section awkward as the tidal stream times are given for each hour of the tide (based on Dover). Every time you change a value above the Menai on the spreadsheet you have to re-adjust the timings for each hour of the tide. Eventually, I got to a point where I was happy with my plan (or I should say as far as time would allow). 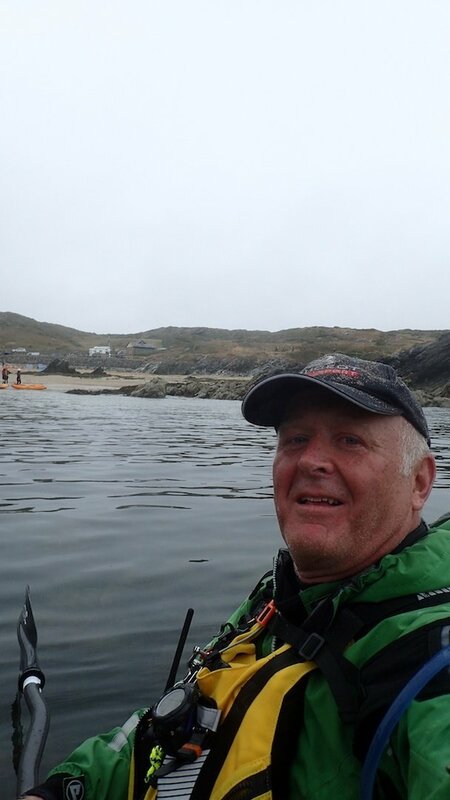 With the hustle and bustle of Porth Dafarch behind me it was great to be on the water. Mini-Mawr was soon passed and so too was Penrhyn Mawr. I was expecting to see Curly out there with Wenders playing on the waves, but I had the waves all to myself. Stopping for some pictures of South Stack I seemed to be making good progress. I'd previously checked the ferry timetables to see if there were any comings or goings whilst I crossed the harbour to the Langdon Cardinal. I reckoned I would be ok as the next ferry movement would be arriving shortly after arriving at the Langdon Cardinal. I was right, approximately half way between North Stack and Langdon Cardinal I saw a distant white square shape of the ferry bridge, coming over the horizon. And sure enough by the time I was approaching Langdon cardinal the ferry was entering Holyhead port behind me. I checked the time against my plan and realised I was about 7 minutes behind schedule. Oh well, I will need to do some tinkering with my spreadsheet when I get back. At West Mouse I could see three kayakers playing/surfing on the waves. I was a little surprised how big the waves were especially with it being neaps. I said a quick hello before carrying on. All the time I was looking at the water ahead trying to work out where the faster water was. Around about middle Mouse I remember a puffin circling me with its mouth full of sand eels. Rounding Point Lynas I was expecting things to slow down a bit, but was pleasantly surprised at my speed. The swell was against me, but I was able to use the back of the waves to keep my speed up. Between Point Lynas and Puffin Island there were lots of Gannets flying over and gawking at me, along with Shearwaters skimming the waves and altering their course at the last minute as they buzzed passed me; and of course there was the ever present screeching of Terns dive bombing for fish. There were also some Black Guillemots, a bird I never seen before, but instantly recognisable as a Guillemot. I looked them up when I got home. In the end though paddling towards Puffin Island was hard going. It was around this time my head was trying to convince my arms for whatever reason to stop paddling. I battled on. "Oh no" I thought, "I am only a few hours in, what is it going to be like after 8 hours, or 12 hours?". Puffin Island always seems so close, and yet you are still far, far away. I was looking at my times thinking I must be well ahead of schedule and I will be passed Puffin Island and into the Menai by at least 17:30. However, it was actually another 45 minutes of paddling before I passed the island. By now though I was actually 12 minutes up on my plan. So I had at least made up some time. My head and arms now seemed to be quite happy paddling away, so much so I caught myself checking my watch and was amazed another hour had passed. 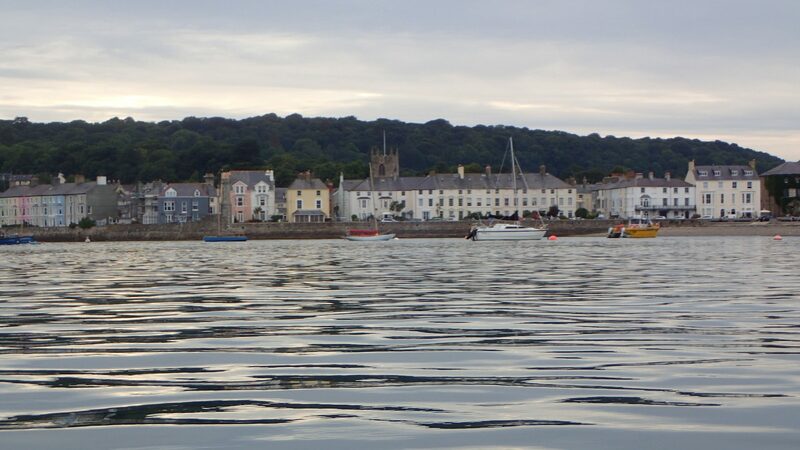 The paddle up to Beaumaris was quite pleasant in the early evening. Looking at the buoys and moored boats I could see easily I had the tide with me. At Beaumaris I heard the sound of a speedboat coming up behind me suddenly slow. I looked around and the driver had obviously slowed down for me, so I waved him on by. Passing me, I shouted a thanks to him and he said some people don't like it when they get zapped. I told him I quite like it rough so no worries. His engine opened up and he was soon gone. Just before Menai Bridge, I took a gulp of water from my hydration bladder tube to only get a mouthful of bubbles. I'd run out of water. Never mind I can stop at Plas Menai, the National Watersports Centre to get some water and it shouldn't be too far. I wizzed through the Swellies all the time looking at where the faster water was. At one point near Cribbin Rock I felt I had slowed considerably, as the water seemed quite confused and it looked like I was on a huge boil, yet looking at my log later on, this was one of my fastest speeds I made on the Swellies. Under the noisy Britannia road bridge and back to peace and quiet as I passed Plas Newydd. I thought about the huge Rex Whistlers picture on the wall of the dining room. If you haven't been it is well worth a trip to see. I was very relieved to arrive at Plas Menai as by now I was definitely becoming dehydrated. I went looking for a water tap, but despite the whole place being open, there was no one around. I shouted "hello" a few times, before I noticed a sink just inside a room. I cheekily nipped in and refilled my hydration bladder. There was also an empty pint glass on the drainer, so I also downed a pint of water, before washing it up and leaving it as I had found it. 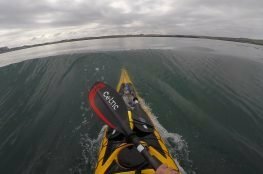 As I paddled off, I saw someone coming down at the centre and we exchanged waves. By the time I was approaching Abermenai point it was getting dark, so I put on my head torch with its flashing red rear light. Passed Abermenai I followed the coast towards Llanddwyn Island, but this stretch seemed very slow. It started drizzling and not only was there an annoying little swell coming in to my left side, I was now into the wind. As I approached Llanddwyn Island it was now pitch black and I started doubting the wisdom of me being out there. In fact, I wasn't really enjoying it anymore, which when I thought about it made me head straight for land. Besides I had packed my camping stuff, so I may as well use it. And besides I had far exceeded my expectations of reaching Abermenai point. Landing on the island I pulled my boat up the beach and erected my tent on the sand. Being wet from the drizzle everything was soon covered in sand. But I didn't care. I pulled myself into my tent and promptly fell asleep. I had my alarm set on my watch, but hadn't changed the time, so it was set to my normal getting up for work time. Consequently I was up at 06:30. After breakfast and an espresso coffee avec sand, I was all packed and ready to set off at 7:30. It was foggy and mizzling. The wind was still blowing in my face and the swell was still an annoying chop. Halfway across Malltreath Bay I went to use my skeg and it was jammed. I gently eased it and it deployed down. I had planned on using the eddies against the tide to ease my progress, but every time I came to a foggy headland there was a little race pushing offshore. Not much point in fighting that, so I stayed further out and plodded on. Then when I went to pull my skeg in a bit, I realised it was still jammed. There was nothing for it but to land and sort it out. 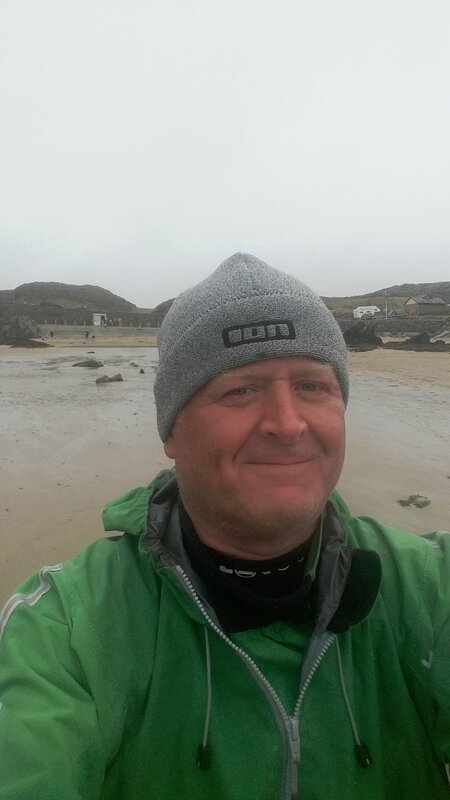 So I landed on Porth y Cwch, a beach a group of us had cleaned a month before. The plastic was unfortunately very much in evidence again. A quick prod with my knife in the skeg box saw the offending tiny pebble out of the way and it was time to set off again. Most of the time now I was working off bearings, as there was nothing to see apart from the occasional dark shape of land through the fog. 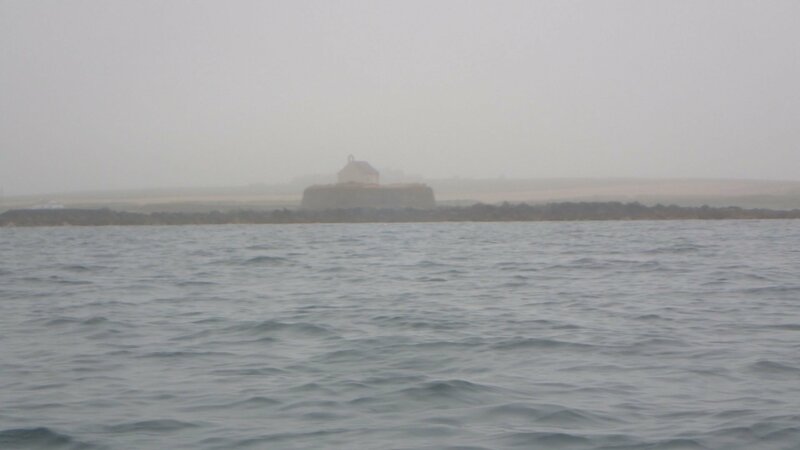 I passed the foggy church in the sea and could easily tell when I was nearing the race track, as I could hear motorbikes slowly making their way around the track. Rhosneigr passed me by slowly, before Rhoscolyn Beacon loomed out of the fog. The wind had eased now and the swell was helping a little. I was quite enjoying the peace and solitude, 360 degrees of nothing all around me. 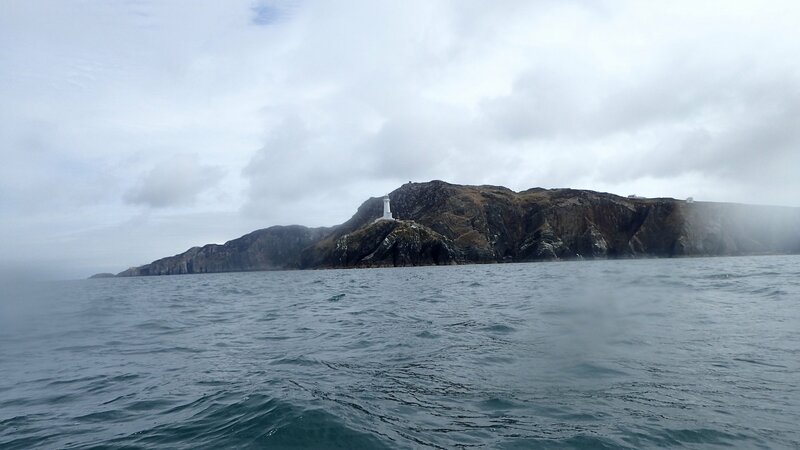 Just the South Stack fog horn occasionally beeping in the distance. Between Rhoscolyn Head and Porth Dafarch I couldn't see land at all. I wondered a few times if I was on the right bearing and not heading off to Ireland. Suddenly the cliff at the entrance to Porth Dafarch appeared in the fog. I'd made it. A moment for a few photos and I landed on the beach. Arriving back at Dafarch still covered in sand! Back on dry land. Job done! Now to have another go on a big tide!